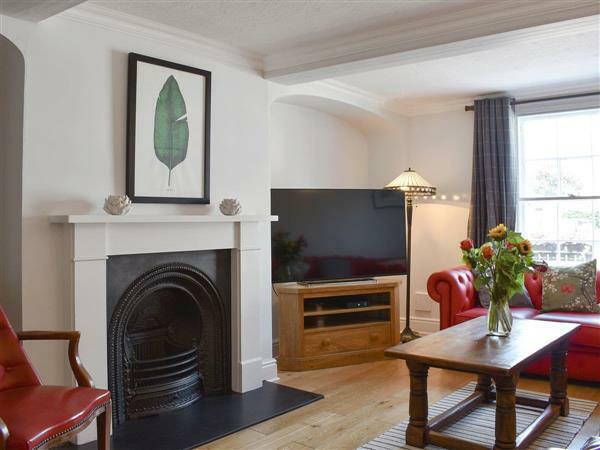 The Town House in Wimborne, Dorset sleeps 8 people. The Town House in Wimborne is an elegant Georgian town house which is located next door to the popular Tivoli Theatre – perfect for a night out. Families, groups or couples will enjoy the delights of this charming town which has various eateries, inns, cafés, traditional shops and the beautiful historic minster. The Town House has many attractive period features, such as high ceilings, wood floors, sash windows and ornamental fire surrounds. On the ground floor is a large bedroom with en-suite bathroom, a living room complete with an open fire, and a kitchen/dining room. Upstairs there are three further bedrooms, two benefitting from en-suite facilities, and a family bathroom with roll-top bath. Outside, the enclosed patio has a seating area and barbecue, and there is a park close by, ideal if you have brought your four-legged friends or for children. It is about a 5-minute walk to the public car park, although overnight parking can be found on the road. Wimborne Minster is centrally located within this quaint town. Built in 705 AD, it was founded by the mother of King Henry V11, and is famed for its chained library and the tomb of Alfred the Great’s brother. Many people also frequent the Gin House which has a large selection of worldwide gins available. There are various festivals and fairs throughout the year too. Within easy driving distance are beaches at Sandbanks, Studland Bay, Bournemouth, Poole Nature Reserve and Brownsea Island, and to the west, you can visit The Purbecks, Corfe Castle and the Jurassic Coast World Heritage Site. For the outdoor enthusiasts there are various walks within easy reach, plus for a family day out, visit Moors Valley which is ideal for all age groups and is also dog friendly. As well as scenic walks and excellent wildlife spotting, there are a host of recreational activities available such as angling, orienteering, cycle hire, golf, Go Ape Tree Top Adventure, Forest Segway, walking groups, canoeing and péntanque. For keen amblers, Avon Heath is also nearby. The New Forest National Park is easily accessible and provides miles of scenic walks and a network of bridleways and footpaths, and you can often find the ponies and cattle roaming the streets in one of the many picturesque villages. There is a water park nearby in the charming town of Fordingbridge which also has a host of shops, cafés and eateries, and the gentle flowing River Avon. The Town House is convenient for road links to the cathedral cities of Winchester and Salisbury, Christchurch Harbour and Stonehenge. Other attractions include Marwell Zoo with Peppa Pig World, the National Motor Museum at Beaulieu, Bovington Tank Museum, New Forest Otter and Owl Park and various other tourist attractions. The beach is 11½ miles from The Town House in Wimborne. With the shop, pub and restaurant 100 yards from The Town House. Bedroom 1: With twin beds and en-suite with shower over bath, and toilet. Bedroom 3: With kingszie bed and en-suite with shower cubicle and toilet. Bathroom: With ¾ roll-top bath, shower cubicle and toilet. Gas central heating, electricity, bed linen, towels and Wi-Fi included. Initial logs for open fire included. Travel cot, highchair and stairgate available on request. Welcome pack. Enclosed patio with barbecue. Public car park, 500 yards, at cost; additional on road parking, 300 yards. No smoking. Holidays at The Town House run from Monday to Monday. Pets allowed at The Town House. For a better idea of where The Town House is, you can see The Town House on the map below. You can find more large holiday cottages (that's cottages which sleep 8 or more people) in Dorset. If you want to see more large cottages, have a look at large cottages in Dorset. The Town House is in Dorset; should you be on the lookout for a special offer, you can find all the special offers in Dorset. It's always worth checking to see what is on offer at the moment. Do you want to holiday near The Town House (UKC3925), you can see other cottages within 25 miles of The Town House; have a look to find your perfect holiday location.